Side by side documentary is a fascinating documentary. The documentary covers the history of photo chemical film. Also the work flow of film compared to digital. Digital film making cameras.vs Film cameras. During the documentary Side By Side. Keanu Reeves explains the differnent way that Digital film cameras compared to Film cameras capture the light Information. The Documentary explains how the first CCD was created by Bell Labs back in 1967. The CCD collected the light Information using pixels. Sony then adopted the Idea with a dream of producing electronic cameras for use in Hollywood. Directors views of digital film making and film. 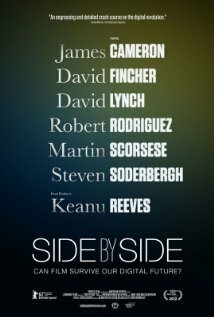 The documentary Side By Side Interviews many famous film directors. The film directors Interviewed range from Martin Scorsese to Geogre Lucas. Many directors such as Christopher Nolan argue the case for shooting on 35mm film stating that It was the Gold standard of Image quality. Film director Danny Boyle argued in favour of digital film making due to ease of shooting. Using the filming of Slumdog Millionaire where digital film making allowed him to shoot in Inaccessible places. One other advantage of digital was the small size of the cameras. One thing that was very noticeable during the documentary was how polarised the views where between film and digital. There is no doubt that digital film making will only get better as the technology Improves. As a film maker myself I could see the validity in both sides of the argument. The final problem that I will always have with digital film making is that Its not film. You see no matter how many pixels, or what dynamic range digital has, it is not chemistry its electronic. Film has a grain a texture and a quality that digital will never possess.